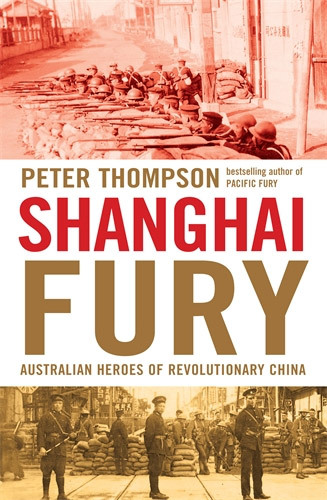 Peter Thompson's latest tour-de-force, his third book in the Fury Trilogy is Shanghai Fury: Australian Heroes of Revolutionary China. It chronicles the part played by two Australians: George Ernest Morrison and William Henry Donald in bringing down the 2,000 year old Empire to replace it with the modern China of today, the world's largest and most varied Republic. Covers the debacle of Australian and New Zealand troops in Crete in 1942. They fought with tenacity and valour, but were just overwhelmed by the German force of Paratroopers who fell out of the sky. Many of the Allied forces were killed, whilst the remainder became POW's. The first volume in the Fury Trilogy, of course covers the Pacific War with the Japanese attack on Pearl Harbor on December 7, 1941, thus bringing the United States into WW2, and ensuring in the longhaul that the Allies would be victorious in WW2. The sinking of HMAS Canberra at the Battle of Savo Island on August 9, 1942 and my part as her Officer of the Watch on her bridge when this action commenced are featured. Solomon Islands and the landing of US Marines to combat them, the tide turned as the Allies reached the Fork in the Road that finally led to Tokyo. I was there serving in the heavy 8 inch cruiser HMAS Shropshire, as a Lieutenant RAN. as a Lieutenant RAN. A truly memorable day indeed, 6 years of war at sea finally at an end.